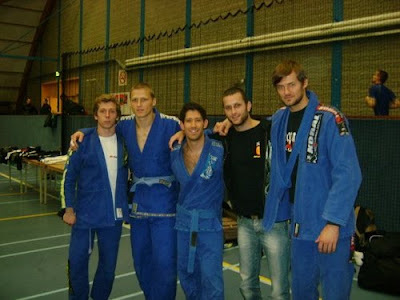 Niels, Robin, Gustavo and I were fighting at the Amsterdam Open on october 25th. While Niels still learns how to handle competition, he got to fight twice and increased his tournament experience. Robin and I didnt survive the first round of our respectives weight classes, both losing by points but we made it up for ourselves in the absolute with a victory on points for Robin and a victory via submission armbar for myself. The absolute was surprisingly all colored belts together and I found myself fighting a brazilian purple belt in the secound round. The fight was going well and while trying to play it open and aggressive, I unfortunately left some points to my opponent. At some point he got to mount me which I defended quickly by sweeping him and trying to open his guard. I finally found myself on my back again, working from my guard which is a place that feels like home to me. I threw on a triangle that I couldnt lock right away but that gave me the opportunity to sweep him. While mounting him I locked my triangle and rolled back thinking I was gonna be able to finish him. Unfortunately, time was over and the points lost at the beginning of the fight made the difference. Still I felt I could have got more out of this fight and it sure boosted my confidence. Robin wasnt able to submit his second opponent either but fought very well. The revelation of the day came from our friend Gustavo who came out strong in his weight class and outplayed his opponent with a vicious half guard that brought enough points for victory. Gustavo took silver as his first opponent never showed up. His finale was against a stronger guy who scored two points and controlled the rest of the fight. In the absolute, Gustavo did it again, holding the distance against a larger opponent and introducing him to his aggressive half guard. His second fight was against a purple belt weighing a good 30+ kilos extra dan him. He got choked halfway through the fight. Congratulations to all of the guys for putting up nice fights and representing the academy so well. Next up: the Dutch Open in Oss next weekend where we'll be for the first time ever with a larger group of people. Report next week. Last week to register for the Amsterdam Open. 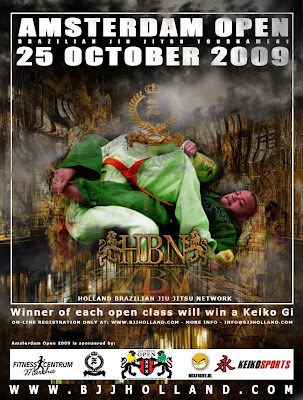 Those of you who still want to compete in Amsterdam on October 25th should head up to www.bjjholland.com and register asap because registrations are closing soon. The next competition will be the Dutch Open in Oss on November 14th. We will try to gather a larger amount of people from Gent and Brussels for this event. Thomas and Ben will be competing as well. The club website http://www.bjj-gent.be/ is being revamped by Robin and should be ready in its new version pretty soon. Summer's almost over and training has resumed for good. Getting ready for competitions in october and november before the first big test in january at the european championship. I will soon be posting the ones we will go to. We've added an exta day to the training schedule in Gent. You can now come and roll with us on sunday. So far it's been really cool, fewer people but very good trainings. There are a few stages coming up in Belgium with Marco Barbosa and Mauro Chueng. Check out mixfight for more info. These are definitely worth checking. Yesterday I went to train at Exit Leuven together with Thomas and Ben. We had a very good time with the guys from Exit who are great BJJ practitionners. As a result, today I feel really sore, my right ear and my right eye hurt but the sparring was worth the pain. There will be an announcement regarding the new structure of BJJ Gent in the next few weeks. Some things have changed for the better and we will let you know in due time. New Blue Belt in Gent. Thanks to Thomas for his time and patience with me. Thanks to the team and all the people I've been rolling with for the last 12 months. Last but not least, I went to fight at the Brabant Open in Tilburg on June 20th, two days after I received my blue blet. The least I can say is that I got roughly welcomed in the blue belt division. I lost my first two fight by submissions at -88,3 kgs (armbar and choke). I got to win my first fight in the open class by armbar (against a white belt, but at least a very good one as he got voted most technical fighter of the tournament) and finally lost my second fight by armbar to a very good blue belt this time. Niels came with me for his first BJJ competition experience. Niels got to fight 3 times and despite 3 losses, I still think he won the very first fight in his BJJ journey by stepping on the mat after only 2 months of training. Needless to say that I had a blast in Los Angeles last week. I got to see so many great fights in all classes and categories and even more amazing competitors during these 4 insane days. This was a truly wondeful experience and I hope to be part of it again next year. On a personal level, I want to thank once again my trainer Thomas Zenthner for his knowlegde and the hours spent training and sweating together. I finished both my first 2 fights by submission (triangle) and lost in semi-final to decision (2-0). Most of all I want to thank all my teammates for making this possible. 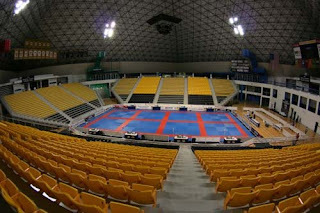 Without people to roll with, there would have been no serious training and in no way I would have ever thought about going to Long Beach for the mundial. This is a podium for the entire academy and all the dedicated people training relentlessly week after week. The academy in Gent is only about 18 months old and we struggled a lot in the beginning due to a lack of people to train with. Now things are coming together and we've gathered a much larger group of people to roll with which makes things way cooler and way better for all of us. So thanks again to all of you for your presence and support. The Long Beach State University pyramid. Congratulations to Robin and Dominique who received their blue belt from Thomas and Ben last week. This is together with our first blue belt Stef, the second and third blue belts awarded at the academy in Gent. This proves that hard work and motivation remain some of the most important aspects of BJJ. Both Dominique and Robin have been with us since the begining and Robin recently won his first competition at the Limburg Open. Congratulations to Robin for his 4 (!!!) triangle submissions in 5 fights during the open class. In other news, there's some change to the payment system of the Academy in Gent so head over to http://www.bjj-gent.be/ to find out more about it. I'm in Los Angeles right now where I'm waiting for the World Championship to sart on thursday. I'm really excited to be here and I cant wait to fight. The weather is not as warm as I expected it to be which is a good thing right now. I'm already over the time change as I prepared myself to it during my last weekend in Belgium. I will try and post regular updates as the competition goes on. There are a lot of fighters I want to see especially in the black belts divisions but also in some of the purple divisions.